Modular housing, 3 module size. Measurements are true RMS values and provide for reliable operation even in presence of harmonics. – 1 relay output with 1 changeover contact for DMK… R1 only. – Modular DIN 43880 housing, 3 modules. – IEC protection degree: IP40; IP 20 at terminals. – Frequency measurement range: 50-60Hz +/- 10%. – Measurement accuracy: +/- 1 digit. – Accuracy 1 degree +/- 1 digit. DMK 84 – DMK 84 R1. – Cosphi measurement error: +/- 0.5 degrees +/- 1 digit. 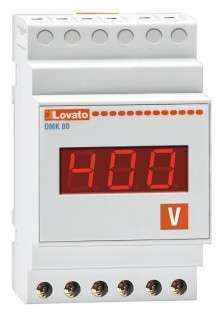 DMK80 1 voltage value, 1 max voltage value, 1 min voltage value. DMK80R1 1 voltage value, 1 max voltage value, 1 min voltage value, relay output for control and protection functions. 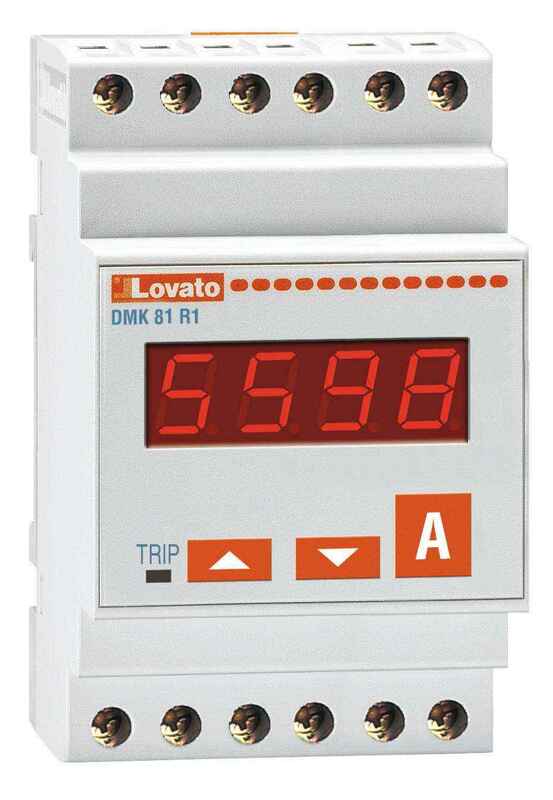 DMK81 1 current value, 1 max current value, 1 min current value. DMK81R1 1 current value, 1 max current value, 1 min current value, relay output for control and protection functions. DMK82 1 voltage or current value, 1 maximum voltage or current value, 1 minimum voltage or current value, The DMK02 can operate as a voltmeter or ammeter. It is duly equipped with two front plates (V and A) which must be fitted by the user depending on which instrument is required and on the wiring scheme used. 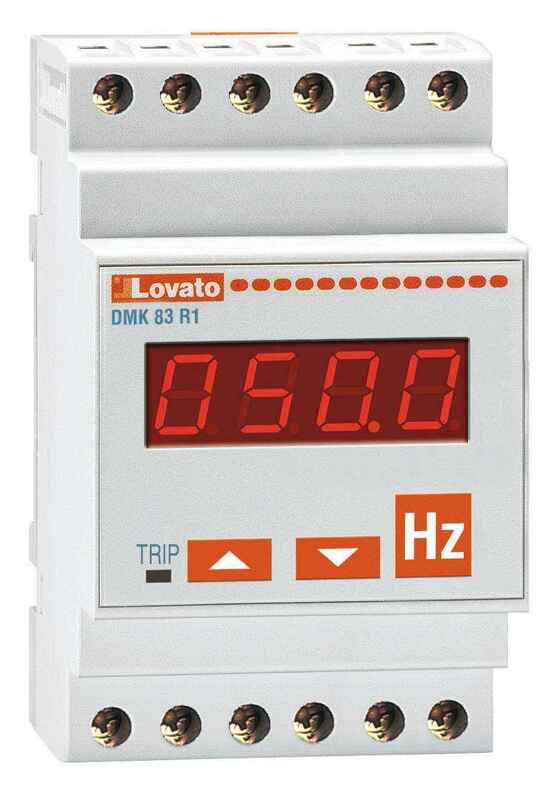 DMK83 1 frequency value, 1 max frequency value, 1 min frequency value. DMK83R1 1 frequency value, 1 max frequency value, 1 min frequency value, relay output for control and protection functions. 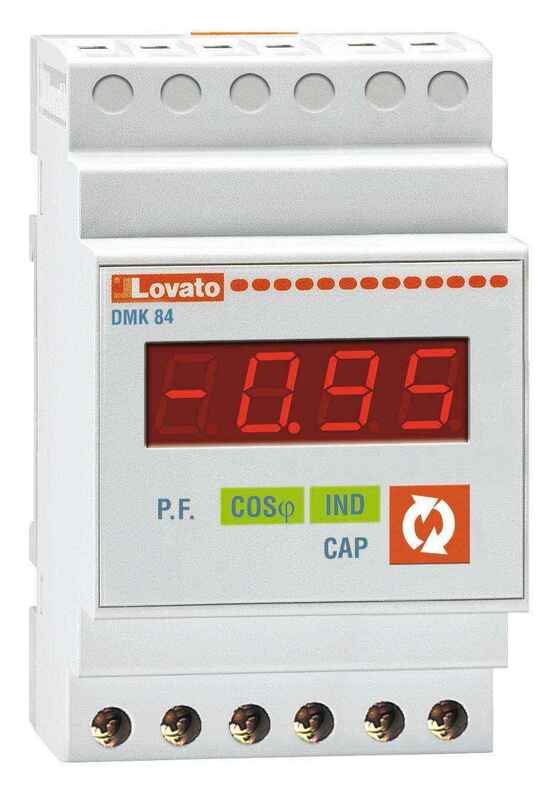 DMK84 1 cosphi value, 1 power factor value. DMK84R1 1 cosphi value, 1 power factor value, relay output for control and protection functions.